1. To release from some kind of entanglement or difficulty; to disengage: Melba's brother still hasn't been able to extricate himself from his mental problems. The deliveryman extricated his truck from the mud with the help of a farmer and his tractor. 2. To remove or to free someone or something from an undesirable situation; such as a trap or a difficult problem: Several survivors were extricated from the wreckage that resulted when two trains ran into each other. 3. 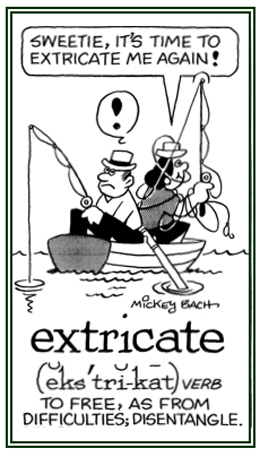 Etymology: from Latin extricatum, "freed from perplexities; from ex-, "out of" + tricae, "difficulties, tricks, confusions". © ALL rights are reserved. 1. To make or to build something: Oliver and Jill are planning to have their house fabricated before winter comes. 2. To make up or to create something; such as, a story in order to fool or to trick people: The journalists at the local newspaper were fabricating sensational stories in order to sell more copies of the latest edition. © ALL rights are reserved. 1. To make statements that are not true; to lie: Mike's daughter falsificated when she told him that she had spent the afternoon studying for the final exam that would take place in high school tomorrow. People are complaining that the political candidate is falsificating more often than telling the truth about what he will do if he is elected. 2. 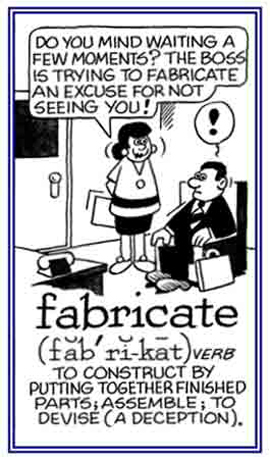 Etymology: from Latin falsificare, "to act dishonestly". 1. To have a sensation on the skin as if ants are crawling around: To formicate is a neurologically based hallucinating process in which people feel as if insects are creeping all over their skin, sometimes as a result of abusing themselves with drugs or alcohol. 2. To crawl or to collect in swarms; such as, ants: Mrs. Jones was quite disturbed by the many insects that she saw formicating across her kitchen floor! 3. 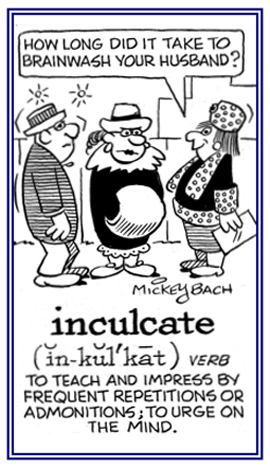 Etymology: from Latin formicare, "to crawl like an ant". To take something illegally or to obtain unlawfully: There are stores that have trouble with people who are furacating products and that is why there are hidden cameras and personnel who are watching and trying to catch those who are guilty of attempting to sneak away with so many items without paying for them. To split or to divide into sections: Because of the construction being done on the road, the contractor decided to furcate two temporary ways to go around on both sides of the old roadway that was being renovated in the same directions as they did previously. 1. To pledge property or goods as security for a debt without surrendering ownership: Mr. and Mrs. Smith hypothecated their house to the bank for a loan because they needed to buy a car and did not have enough money to pay for it. 2. 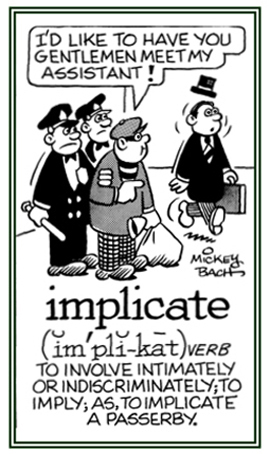 Etymology: from Latin hypothecare "to deposit" ; from Greek hupotithenai, "to put under, to deposit as a pledge"; from hypo-, "under" + tithenai, " to place". 1. To cause something to superimpose or extend over a specified area; such as, body tissue: There are times when surgeons imbricate parts of the body to overlap with certain fibers in order to improve the contour or shape and tensile strength of the tissue around a hole in the body. Sometimes surgeons imbricate specific layers of tissue when closing a wound or some opening in a body part. 2. To lay or to arrange regularly so as to overlap: From the street, it was easy to observe the workers imbricating the roof with tiles which appears to be harder to accomplish than flat-surfaced roofs. 3. 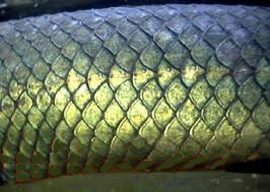 To form patterns in plants and animals that are producing parts being above and below each other: Fish scales are imbricated in a regular way as is presented in the picture below. A shingle-like structure in a deposit of flattened or disk-shaped pebbles or little rocks: Imbricate bedding is an elongated and commonly horizontal area of small cobble stones in sediments which are deposited so they overlap one on top of another one like roofing shingles. Imbricate bedding comes from strong currents that move over a stream. To reveal or to show that someone is participating in or is connected to something illegal or morally wrong: The politician was implicated in misappropriating government funds to support his election. The robber's confession is implicating two other men who were involved in the holdup of the bank. 1. To utter obscenities or profanities: After hitting his thumb with the hammer, Charles started to imprecate at the top of his voice. 2. To wish harm upon; to invoke evil upon: The three witches in the Scottish play were on the moors imprecating against the Scottish lord. 3. To call down harm; especially, a curse on someone: After experiencing one disaster after another, the farmer was so upset that he imprecated against the weatherman because of the misleading forecasts. 4. 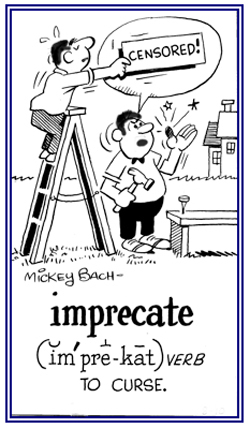 Etymology: Latin imprecari, imprecat-; in-, "towards" + precari, "to pray, to ask". © ALL rights are reserved. 1. To fix something firmly in person's mind by frequent and forceful repetitions: Peter's parents were inculcating him with a sense of responsibility for his behavior and his future career as a medical doctor. The teacher's in Karen's school often inculcated their student's with a sense of responsibility for achieving the best education possible. 2. 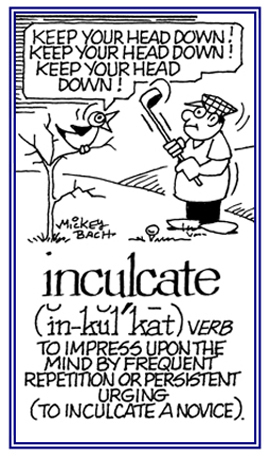 Etymology: from Latin inculcat, "pressed in"; from the verb inculcare, "to force upon, to stamp in; from in-, "in, into" + calcare, "to tread, to press in" from calx, calc-, "heel". © ALL rights are reserved. 1. To darken, to make black, or to obscure: When Jake looked out of his window, he noticed that the mountains were infuscated with fog. Tom used black dye to infuscate his shirt completely so all of the spots which were seen before were no longer visible. 2. Etymology: from Latin infuscare, "to darken, to discolor".